I know I'm probably starting to sound like a broken record but high street makeup brands have been stepping up their game recently and bringing out some amazing new products. Now, this one might not particularly be new but it is a new discovery for me. I have always been quite weary of high street foundations and since I tried the Born This Way foundation from Too Faced I was worried that no other foundation might the high standards that foundation brings, however, since I was running low on my Born This Way foundation I thought I would go on a hunt for a drugstore foundation to try out and I discovered the Bourjois Healthy Mix Foundation, so lets jump straight in to what I think about this new discovery. "Bourjois NEW Healthy Mix foundation had just got even better! Give your skin a radiance boost and leave it looking flawless for up to 16 hours! 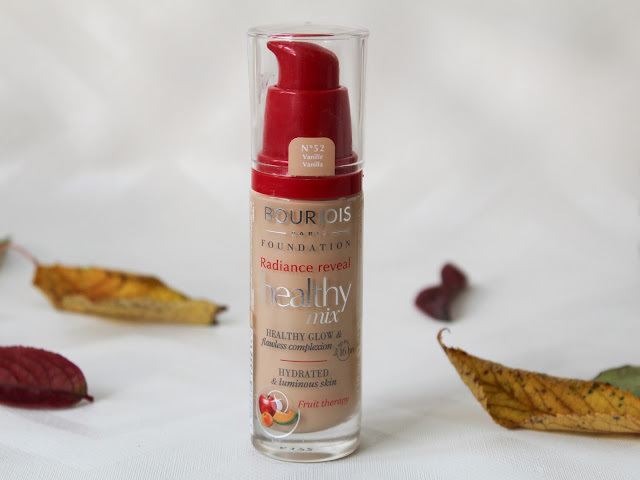 Bourjois’ new Radiance Reveal Healthy Mix foundation is enriched with a fruit therapy formula to enhance your complexion." It says to have Apricot - for radiance, Melon - for hydration and Apple - to protect your youth and also enriched with crystalline pigments to even out the complexion while letting in the natural light for that healty looking glow. I love the finish of this foundation, it is a semi-matte finish and It blends out really well on the skin, I prefer to apply my foundation with a beauty blender as that is just my personal preference, but I haven't tried it out with a brush. The beauty blender also helps to make your foundation look flawless. However, I am not sure about the lasting for 16 hours part, which is a claim I tend to ignore anyways. Some days I am up and out the door to uni at 7:30am and I don't get home till around 4/5pm so my makeup is on for a long time. The one thing that I have noticed with this foundation is that by the middle of the day my foundation will start to wear off on and around my nose, now that might just be due to me being quite oily in that area but I have noticed it a lot more with this foundation than any others. I find that by blotting my skin and then adding a little powder, that helps to keep everything looking nice and flawless. By the end of my long day, my makeup is ready to come off, I mean it has been on for nearly 10 hours, I would be falling apart too. Apart from that, the coverage is brilliant, I would say medium to buildable coverage and plus it has a lovely fruity smell to it that makes putting your makeup on that little bit better. 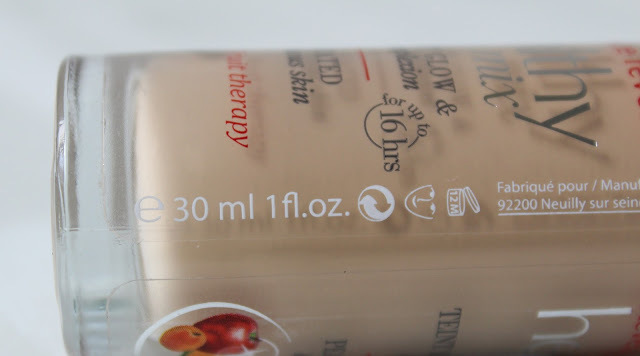 This foundation doesn't cling to any of the dry patches on my face, it covers my dark circles pretty well, as well as any blemishes or spots that I might have on that day. I always set my foundation with a translucent powder to hold it into place too. Now, lets talk about shade range and packaging. I was quite dissapointed in the lack of shades to choose from when I was in Superdrug picking this up. From what I could see was that they only had about 8 shades available and that was it. I would have liked to have seen a lot more shades available as not everyone has the same skin tone, and it makes me pretty sad that they don't bring out a wider variety. So I chose the second to lightest shade No 52 - Vanilla, now this should not be the second to lightest shade becuase I know many people who would not be able to wear the lightest shade becuase of it being too dark. I got quite lucky with this shade and it matched me perfectly. I have yellow undertones which this shade has too, so it was a perfect match in the end. The packaging I like too, the red of the pump really makes it stand out and hard to miss. The glass bottle makes it feel a little more expensive than it actually is, just don't drop it like I did, thank the lord it didn't smash! 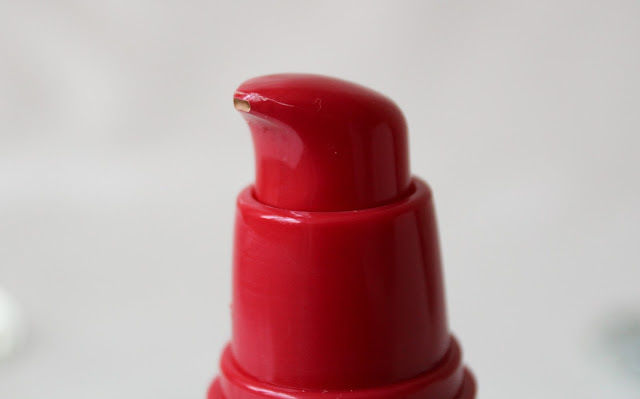 I also love that it has a pump, I never realised how much I loved a pump on a foundation until I got one that didn't have a pump and I was devastated haha. The pump makes it easy to disribute the certain amount of product that you want and also stops you from wasting a lot of product too. As you can see from the picture below, you get 30ml of product in this bottle which I believe is the standard amount in any foundations now. 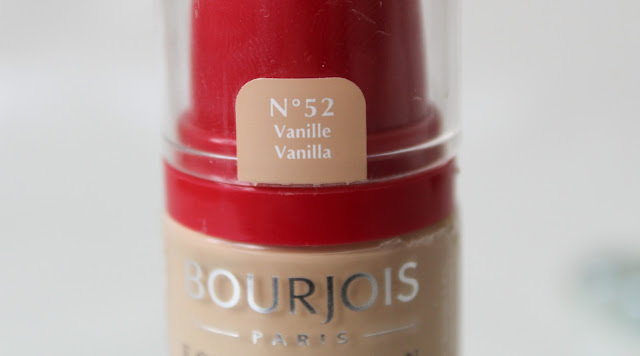 This foundation retails for £9.99 in Superdrug and you can grab it here. For a high street foundation, I think the price isn't too bad, it could maybe be slightly lower but still, it's better than £30 for the Too Faced foundation! Overall, this is a great foundation for someone who might be on a budget or who is like me and really does not want to fork out for a really pricey foundation. The finish is beautiful, it does last a long time and it doesn't emphasis any dry patches on my skin either. 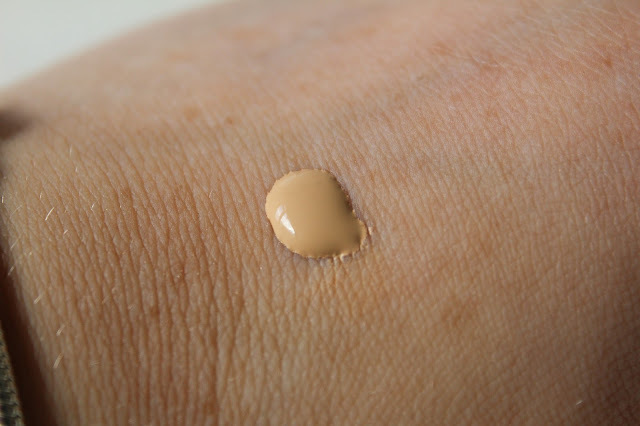 Do you like this foundation? What is your favourite high street/drugstore foundation? Let me know in the comments. I think the shade range would work quite well for me since my skin is yellow toned, but I know that it really wouldn't suit some of my friends. I'm yellow toned too so I think that's why it works for me! The shade range is pretty annoying! Thank you for commenting! I hope you like it!